IT'S FOUR HOURS LONG, CONTAINS JUST ONE SONG AND THERE'S ONLY ONE COPY OF IT - ON AN OBSOLETE FORMAT. JOE CLAY GETS A SNEAK PREVIEW OF THE WORLD'S MOST EXCLUSIVE REMIX. As the digital download death ray lays waste to the traditional music industry, record shops are on the verge of total annihilation. Miserable at the thought of the eventual demise of music as a physical product, James Rutledge has dreamt up the ultimate reactionary statement. Rutledge, who has been recording under the pseudonym Pedro for nearly a decade, has concocted a potentially record-breaking four-hour remix of Radiohead's Videotape, the closing track from last year's In Rainbows album. The marathon-length remix is only available on a 240 minute VHS video cassette - an obsolete format - with accompanying visuals created by Philip M Lane. And if that's not exclusive enough, try this: there's only one copy in existence. Having made a small name for himself recently with remix work for bands including Foals and Bloc Party, the Radiohead project was an opportunity to take the concept to extreme new levels. "I initially had the idea of doing a long remix when I was listening to Videotape on a train journey," Rutledge explains. "I kept repeating the track on my iPod and I remembered how I used to make tapes that had the same track recorded 10 times on one side of a D90 if I liked it a lot. I wondered what I would do if I was asked to remix the track, and came to the conclusion that I would extend it into endless ambience." The inspiration for the resulting remix was to be found within source material. "As I got more into the lyrical content of the track I thought of the VHS format as being perfect for the remix. Then the four-hour thing started to creep in. I just thought it was kind of funny and so extreme. Plus, there was a certain irony in making an undownloadable version of a track from an album that was originally only available as a download. Even if it leaked, who would bother to download it and listen to or watch the whole thing? Of course, Rutledge isn't the first artist to use radical packaging to add collectable exclusivity to their music. Back in 2004, Aphex Twin launched his Analord series in a faux-leather binder containing one 12-inch single, with plastic sleeves to house a further ten slabs of vinyl, released over several weeks. Complete sets have changed hands on eBay for over £500, and it's impossible to find mp3s of all 42 tracks online. Electronic industrialists Coil released their final studio album, Ape Of Naples, in a wall-mounted wooden box, to house three lathe-cut vinyl acetates in an edition of 23, retailing for £999. A whole new cottage industry is emerging from the underground, as more artists bypass the usual methods of distribution, creating unique, handcrafted CDs in limited quantities, to be sold directly through their websites or mail order companies like Norman Records in Leeds. It took Rutledge one exhausting week to complete his remix; seven days and nights spent swimming in a sea of ambient loops. "My girlfriend was away in Tokyo," he recalls. "And I just did it, staying up until 4am most nights. I felt like I was going mad." Rutledge's main inspiration for the remix was the minimalist composer Arvo Part and Chicago musician Jim O' Rourke. The resulting piece of music is epic and repetitive - as exhausting to listen to as it was to create. But it's never an unpleasant experience. Sonically, it constantly evolves, and it's easy to become immersed in the cavernous wall of sound. Recognisable bits of Radiohead's original track crop up here and there, predominantly the repeating piano pattern. Like the remix, the visuals work around repetitive loops. 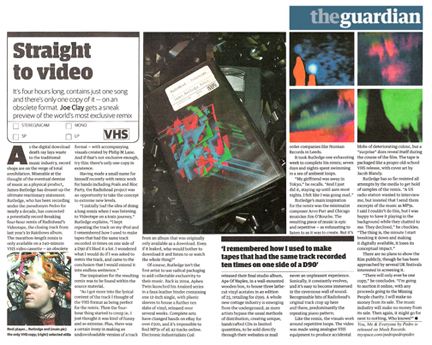 The video was made using analogue VHS equipment to produce accidental blobs of deteriorating colour, but a "surprise" does reveal itself during the course of the film. The tape is packaged like a proper old-school VHS release, with cover art by Jacob Blandy. Rutledge has so far resisted all attempts by the media to get a hold of samples of the remix. "A US radio station wanted to interview me, but insisted that I send them excerpts of the music as MP3s. I said I couldn't do this, but I was happy to have it playing in the background while they chatted to me. They declined," he chuckles. "The thing is, the minute I start breaking it down and making it digitally available, it loses its conceptual impact." There are no plans to show the film publicly, though he has been approached by several UK festivals interested in screening it. "There will only ever be one copy," he concludes. "I'm going to auction it online, with any proceeds going to the Missing People charity. I will make no money from it's sale. Then again, it might go for next to nothing. Who knows?"